Students of Austrian business cycle theory are familiar with the term malinvestment. A malinvestment is any poor use of resources or capital, commonly made in response to bad policy (usually artificially low interest rates and/or unsustainable increases in the monetary supply). The dot-com bubble that popped in 2001? The housing bubble that similarly burst in 2008? Those were classic examples of malinvestment. With this article, I'd like to introduce a related term: malincentive. While not part of the official economic lexicon, I consider 'malincentive' a useful word to describe any promise of short-term gain whose long-term costs outweigh any immediate benefits enjoyed. The temptation to urinate in one's pants on a cold winter day to get warm is a (perhaps unnecessarily) graphic example of a malincentive. Yes, a momentary relief from the cold can be achieved; but moments later, you'll have a much larger problem than you did at the outset. Malincentives and malinvestment go hand-in-hand. In my opinion, the former causes the latter. As humans, we respond remarkably well to incentives. And dumb incentives encourage us to make dumb investments. In this current era of central planning, malincentives abound. We raced to frack as fast as we could for the quick money, while leaving behind a wake of environmental destruction and creating a supply glut that has killed the economics of shale oil. Our stock exchanges sell unfairly-fast price feeds for great sums to elite Wall Street high-frequency-trading firms, and as a result have destroyed investor trust in our financial markets. The Federal Reserve keeps interest rates historically low to encourage banks to lend money out, yet instead the banks simply lever up to buy Treasurys thereby pocketing vast amounts of riskless free profit. The list goes on and on. One particular malincentive has been catching my attention recently, one that feels especially pernicious because it does not seem easily reversible, if at all: For US employers both large and small, it's becoming increasingly less appealing to employ human labor. The above combined typically result in a cost between 1.25-1.4x a worker's base salary. But this is not the 'all-in' cost. There's also the cost of office space, equipment, management & supervision, training. Of HR services. Of paid time off. Of lost productivity if a worker turns out to be a bad hire. Simply put, people are expensive to employ. But the situation is getting even worse. Employers of every size are experiencing a growing surge of additional costs in regards to their human workforce. The recent push to dramatically increase the minimum wage over the next several years is currently being hotly debated. However, one thing that is not up for debate is that this rise will make the cost of labor substantially greater for businesses -- especially smaller businesses, as a greater percentage of their employees are at the minimum wage level. For instance, the hike to $15/hour now legislated for California and New York represents rises of 50% and 67% respectively from current levels. Businesses will not be able to absorb that labor cost increase without reducing headcount, raising prices and/or cheapening quality. Likely some combination of all three. Under the health care law, employers with 50 or more full time equivalents are considered "large businesses" and therefore required to offer employee health care coverage, or pay a penalty. However, employers who are close to reaching 50 full time equivalents are encouraged to closely monitor their workforce, as reaching the threshold and not offering health care coverage can result in steep penalties. What's the natural reaction to this if you're a small business owner? Do everything you can to keep headcount under 50 employees. Fire people if you must. Create part-time positions instead of full-time ones. Outsource. Automate. A 2016 “bombshell” is likely coming from the Occupational Safety and Health Administration, which is expected to increase fines more than 80%. Thank Congress for the “catch-up” increase—OSHA’s first since 1990—that quietly got tucked into a bipartisan budget act in November. The law allows all federal agencies with civil penalties to update fines for inflation. OSHA can increase fines up to 82% and has until August 1 to do so, says Duane Musser, vice president of government relations for the National Roofing Contractors Association. Musser considers the increase an almost a foregone conclusion. And based on testimony from OSHA assistant secretary David Michaels, that seems accurate. To these, add compliance costs for the Americans With Disabilities Act -- which do little to prevent predatory lawsuits designed to shakedown small businesses. This distribution of regulatory costs places small firms at a substantial competitive disadvantage. The cost disadvantage confronting small business is driven by environmental regulations, tax compliance, and occupational safety and homeland security rules. In sum, individuals and businesses bear the burden of the $1.75 trillion cost of regulations, and small businesses bear a disproportionately large share of the compliance costs. Businesses must close, reallocate activity, absorb, or pass on the expense of complying with regulatory requirements. Then, there's the hassle factor. Employees require oversight. Management. Development. They get sick. They take leave. They quit. Some do their jobs well; some don't. Things can get messy, and not infrequently, litigious. Given all the above, is it any wonder that businesses are desperately looking for ways to replace human labor with automation? Forget about profitability, it's becoming about survival. Automation does come with higher upfront capital expenditures, but with the vast savings resulting from removing the fully-loaded costs of human employees, the profit incentive to swap bodies for bots is tremendous. And as robotic and AI technology quickly gets better and cheaper, the siren song only sounds sweeter over time. The categories of jobs that can be displaced by automation is impressive and expanding. Many industries once considered 'safe' now find themselves in the cross-hairs of progress. We have technology now capable of resolving real-world customer service calls, or landing rovers on Mars -- or a freaking comet, for that matter. The 2013 Oxford University study The Future Of Employment calculated that a full 47% of total US employment is at risk of being replaced by 'computerization'. How safe is your job from being displaced by an automatic solution that performs it better, faster, cheaper -- without complaints, meals, vacations, sick days, bathroom breaks, benefits, regulatory obligations, and the rest? Here at PeakProsperity.com, we write often about a coming 2008-style correction (or worse) as the multiple asset bubbles blown by the world's central planners go bust. Assuming for a moment that we're correct in that forecast, we'd see millions of jobs shed again as companies fight to stay above water. What kind of investments will companies make in that kind of environment, when dollars are particularly dear? Answer: the kind that improve a business' cost structure -- that give it more runway, more time, to claw back to health. 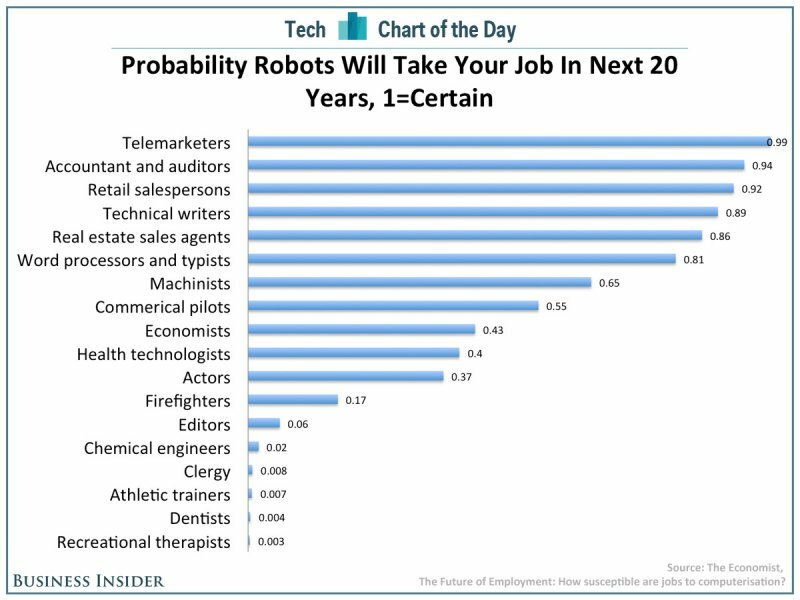 Automation will be at the top of this list. It's very easy to calculate the expected return of technical capex (i.e., making it easier for the C-suite to approve), benefits can usually be seen quite quickly, and the up-front investment cost can often be amortized on an accelerated basis (reducing the optical impact on the P&L). As we've written, we think the worm has already turned, and that we are heading back into recession. There has been a stealth series of mass layoffs since the beginning of the year from major players in Tech, Energy and Finance - with Intel recently joining the list last week, announcing it's shedding 12,000 jobs. The thing to realize -- in fact, the key point of this entire article -- is that jobs lost to automation don't come back. Human labor displacement is a one-way trip. Once an industry has invested in mechanical infrastructure and moved up the efficiency curve, it doesn't ever abandon that investment. There is an intelligent debate to be had on the benefits of automation. Many have argued that the march of technology has always left future generations with more wealth and more meaningful work to do, as the laborious drudgery is increasingly mechanized. What is much less debatable is that displacing a large percentage of human labor without a plan in place to put that displaced labor to productive use is a sure-fire recipe for long-term crisis. Our current trajectory has us hollowing out our workforce at an alarming rate. Unskilled labor needs a place of entry in order to build skills and work experience. Yet we are closing that door. Where are the young workers to get their start in a world where the largest employers simply don't need them? 1 in 5 American households has NOBODY with a job living in it. The youngest workers, Millennials, are earning 20% less than the previous generation, and are drowning under $billions and $billions of education debt. The percentage of Americans now receiving a federally-funded “means-tested program” now stands at 35.4%. When you add pensions, unemployment, Social Security, and Medicare to the mix, the percentage of Americans relying on government for part or all of their subsistence is 49.5% of the American population. The statistics above show that we are badly failing at putting our current excess human capital to productive use. Even with today's 5% unemployment rate (yeah, right), we already have a national employment crisis. What will things look like in 5 years, when millions of today's jobs have been vaporized by the automation wave? Automation is going to happen. And personally, given the extreme set of malincentives we currently subject businesses to, I expect the pace to only quicken from here. From a societal standpoint, I think Nobel Economics Prize recipient Michael Spence has it right (full disclosure: Spence was the dean of my business school during my years there). He warns that the challenge of technological unemployment "will require shifts in mindsets, policies, investments (especially in human capital), and quite possibly models of employment and distribution." It certainly will. The big question is: Will we, as a society, identify and adopt these mindsets/policies/investments/models in time? Sadly, my money is on that we won't. We haven't made much progress in doing so to-date, and the hour is getting quite late to act before crisis arrives. Skill up. Actively develop higher-order expertise, which will be the last frontier for AI to replace. Find a mentor to apprentice to, if you're able. Be entrepreneurial. The best way to avoid being let go by a company is to own it. Let the age of automation work for your benefit, not against it. Be a mentor. More than ever, the younger generation needs pathways to learn. Provide one. Find meaning in your work, as well as other areas of life. Automation may reduce your income, or eliminate it altogether. Don't let that crush your purpose in life. The Eight Forms of Capital framework we provide in our book Prosper! provides guidance on how to live richly even if your income becomes compromised. Support others. A lot of folks you know will likely be laid off as automation advances. Be there for them. Offer support. A lot of people are going to feel lost. Let them know the loss of a job does not equate to the loss of their worth as a person. They still have a valuable role to play -- it may just take a while to find it as we all figure out the new role for humans in this dawning Age of Machines. Good writing. Charles Hugh Smith has addressed some of these same issues in recent publications. I'd like to hear the two of you compare notes and discuss this in more depth. Between automation and a declining consumer base (see link below) the current debt based money system in doomed. Creating and beginning to use a parallel economic system is essential for making a world worth living in. That will be impossible with our current banking system and it's invested bureaucracy. Who is going to buy the products? I fully understand the impetus for automation but what I am left wondering is in our efficient allocation of capital that dis-employs more and more of our population year after year, who is going to be left to buy the products and services from the automaton-driven companies? Is the rise of the machines self-defeating? Is the rise of the machines self-defeating? Yes, if we don't have a plan in place, in advance, to deal with technological unemployment (which, currently, we don't). That's the central thesis of the above article: our existing policies create a fatal malincentive for our society to pursue its own undoing. I am putting this brief comment in this thread as it is the reverse of the trend Adam is writing on: Production of a machine, a backhoe, by a person in their own garage shop. This person now understands the technology from top to bottom, and can maintain / repair it himself. This is the antithesis of the factory automated production line. I am hoping that Blackeagle will come out of the shadows and show us details of how he did this, too! Don't you love social experiments when absolutely no thought has been put into the process? Good article and follow ups, but surely the Achilles heel of automation is energy? On which automation critically relies? My rule of thumb is that one barrel of oil contains the equivalent of around 20,000 hours of human labour (assuming an 8 hour working day, 5 day working week, and 46 week working year). Very rough calculations, but its the order of magnitude that matters. On this basis, energy is - as we all here know - massively under-priced. Given that around 80% of the energy that we consume is fossil fuel sourced, and depleting rapidly, the price of energy must surely, sooner or later, begin to increase to reflect first the increasing scarcity and then second its value, as the scarcity reveals the value. This won't necessarily undermine all energy intensive automated activities, especially those where automation leads to much more efficient use of the automated energy system. For example, automated helmsmen of ocean going vessels, which save energy. But it will surely undermine some of the automated activities? 1. As Immanuel Wallerstein has explained, labor costs are rising for deeply structural reasons that have nothing to do with automation per se: urbanization, externalized costs coming home to roost, etc. 2. Once the tools of automation (software and robotics) are commoditized, i.e. are interchangeable and cheap, profits vanish. This means there won't be enough profits (and taxes on wages) to support the mainstream "solution" of Basic Universal Income for every household. The Federal government already soaks up $4 trillion, and state/local another $1.5 trillion. I estimate guaranteed income schemes will add up to $3 trillion in additional spending--but let's be conservative and say "only" $1.5 trillion. Where is this money going to come from if profits decline 50% and taxes on wages plummet along with paid labor? 3. This means Universal Basic Income is completely unrealistic. The system no longer functions once profits and paid human labor decline for systemic reasons. The conventional "solution" is to borrow $3 trillion a year to fund a $6 trillion welfare state. That is not a workable long-term solution. Conclusion: We need an entirely new system for paid labor. 4. Automation will only displace profitable work. Though it's ignored by our current economic system, most necessary human labor is unprofitable and will never be profitable. 5. We need a new system. Reforming the existing model will not fix the underlying problems. I propose an alternative system called CLIME (community labor Integrated money economy) in my book. Unlike many other proposals out there, it integrates money, community and paid labor. 6. If we don't change the way we create and distribute money, we change nothing. 7. Conventional economics is clueless and has no solutions for structurally higher labor costs and declining profits. Michael Spence has said as much in his articles in Foreign Affairs magazine. 8. The grim reality is the number of people with the traits, habits and skill-sets to create value in a rapidly automating economy are around 5% of the workforce, 10% at the outside. This is one reason why the top 5% of the workforce has pulled away from the bottom 95%. yes, as I endlessly explain, the top .5% has gained wealth from financialization and financial bubbles inflated by central banks. But conventional human labor (even the labor of those with college degrees) is no longer scarce and so it has no scarcity value. Creating value requires creating something that's scarce and in demand. Excellent article this really makes the current story of the conversion of life into money at a near intolerable and extreme level. If we are all one, then the emotional discourse that is present within us has got to be extremely uncomfortable (is this what Chris is and others are feeling?). I would argue that we are getting to the level that we are damaging our DNA structures pychologically thru this emotional discourse, as well thru ecological destruction. A place where tipping points appear all across the spectrum, like a swarm of angry flys, at first you can ignore them and swat them away. The current tipping point, our wiliness to participate in, which I would call it life yet it more accurately resembles money derived experiences is causing many problems. The space between stories is a sacred and amazing place, enjoy while you can there is much pain yet also so much fun to be had here. Adam - Very good article - things don't look good! Just one point - although the article you link to is entitled "The Rising Cost of OSHA Compliance", it refers only to the rising cost of NONcompliance, i.e. heavier fines. The maximum fine for being responsible for a worker's DEATH is going up from $70K to $127.4K. (It is rare that OSHA ends up taking the maximum fine.) Not a lot compared to a wrongful death settlement. The author of that article seems to assume that OSHA fines are a normal cost of doing business in the roofing industry, just something to be written off (along with the injured or dead workers). Unfortunately, I read about all too many employers who seem to feel this way. Folks should just remember that OSHA regulations are written in workers' blood. Disclosure - I am in the OS&H profession helping my employer comply with these regulations. Do you really think that almost all of retail employees will be replaced by robots? Or that accountants and auditors (accounting clerks maybe, but not at middle or high level functions) will be all replaced by machines? Or real estate agents... really!?! Do you want a robot serving your dinner at a fancy restaurant, or helping you to choose you clothes... or giving you a tour of that house you are thinking of buying? Humans are still the ones buying these things, and human contact and interaction is a big part of the experience and the selection process. This discussion really brings into focus the issue of the value of a human being in an age of profound overpopulation. does not have any valued skills. What is the value of a homeless street urchin abandoned to fend for himself in the slums of Rio De Janeiro? What is the value of the life of a soldier in a society with severe overpopulation? In a medieval castle siege, I understand that a siege would be successful if the attacking army had sufficient manpower to burn. Attackers might be killed at a ratio of 10:1 or 20:1. But if a great surplus of population made the lives of soldiers worth little, the cost of a siege might be acceptable, or even desirable, to some. One very adaptable form of robotics not discussed by Adam are biologically based robots. They have the capacity to self-heal, to some extent, and to self-reproduce. Simply put them in a box with enough food, water and sunlight and their numbers will sustain through self regeneration. DNA based blueprints and sub-cellular ribosomal protein assembly work stations seems to be the key to the success of this robot class. I am of course talking about human slaves. Not humans "like us." But that other-kind-of-human (of much lower quality) who are meant to be ruled by us. Though it was not mentioned specifically in the article, the biggest malincentive IMHO is the ridiculously underpriced cost of money ('capital') that is being used to buy automation. Were it possible to have capital cost reflect the market demand for money then I would expect much of this automation would not be so attractive to business. This is wishful thinking in our centrally controlled banking system. But as Nassim Taleb points out in his concept of the Black Swan, if risk costs do not coincide with actual risks, then the chances for a huge Black Swan event can grow exponentially. Before we are done in this cycle, robots will be ordering parts to repair themselves. The idea of manufacturing (literally 'hand made') will be as relevant as buggy whips. Slaves are slaves, whether they be human slaves. energy slaves or animal slaves. The relationship between them has always filtered down to abusive treatment of the subject at hand. How many automobiles last 60 years; my well has been pumping water for 40 years with the same hardware and, hopefully, will last another 40 as long as they still make parts for it. I treat it,well(?) and it reciprocates. Relationships and community are the first thing we will lose if we embrace automation in an energy intensive manner. I understand your incredulity. Seems impossible to me too but then again so would a lot of things we have today if you had asked me about them 10-15 years ago, ZIRP, NIRP, Homeland security, TSA, asset forfeiture, and the list goes on. The list of jobs to be lost doesn't even include all of the truckers, taxi drivers and other drivers who will be done in by self-driving vehicles, or the delivery people getting undercut by drones etc. The road to our collective unemployment will be paved one cost savings decision at a time. Do you think there won´t be a fee involved? It´s just not going to the real estate agent, but to the real estate owner.. or to the robot that owns the real estate agency. Take that reasoning to the extreme.. we will all be working to "feed" the machines instead of the opposite. If robots can do everything, what´s the point of humans being around? Don´t see how that will work out. At some point the trend will be fought and reversed or we will go the way of the dinosaurs. I'm sure there will be a fee, they will just charge less, maybe just the half that goes to the agency. Of course, once they run the actual agents out of the business the fees will start creeping back up again. Anyone else remember when ATMs started? They used to say that you could get your money at anytime and there would be no fees. How's that working out now? I don't use the things though my wife does. I agree with you that this is an insane process. I think that is the point that CHS and Adam are making. Without any real planning this mess is a guaranteed disaster. The individual decisions for each business make sense financially but the collective process is a social disaster that will not even work financially in the end. Makes you wonder who wins in this scenario. It is not any of us. Technology has greatly increased the productivity of an hour of labour. We all here understand why economic growth is now nearly finished due to resource limits. Historically, there has been no method of transferring wealth to the middle class, other than welfare which just keeps the lower class alive and from rioting. Historically, it has been the middle class who has "created" the wealth so why would there be a need to transfer wealth to the middle class? "Just get them working and producing again!" has been the main focus of economic policy, both on the left and the right as different ideologies argue about what makes labour "productive" and best gets them back to work to foster more growth (Marx vs von Mises and everyone in between). This situation is exacerbated by free trade with places like China and Bangladesh which effectively brings much of the western workforce down towards the level of the third world. The justification for global free trade goes all the way back to Adam Smith who argued that the more that goods trade and change hands before final consumption, the more value is ultimately incorporated into them. Therefore, free trade is good. This was a good observation at the time but is invalid. Nowadays, free trade is just an excuse for corporations to be more globally competitive using cheaper labour and weaker environmental laws overseas, and to get access to larger markets. With 350 million people there is no reason why North America could not be fully self sufficient and block all trade with the rest of the world. Why do we need to be economically tied to another 6 billion people? Are we really benefiting from economies of scale at this point or is there some other more nefarious reason for free trade? I'm not seriously suggesting isolating N America, just pointing out that overall in the long run we would be more prosperous if we did this since we have fewer people than Asia, and generally more remaining natural resources per person. The middle class is constantly parasitized of its "created" wealth by the financial elites through their financial shenanigans (negative real interest rates on savings for the masses, but huge levered derivative profits for the elites at the top engaging in insider trading using their own personal money printing presses.) With these real profits the elites buy up all the productive assets, leaving the middle class as mortgage-slave debt serfs with little net worth or real ownership of anything to fall back on. This situation generally worked historically when the economy was capable of growing and additional wealth could always be "created" from the natural world by the middle class to offset this theft. The theft actually incentivized the middle class to work harder and further grow the economy. But when the economy can no longer grow, no new "wealth" can be "created", so the ongoing theft from the middle class just sends it into the lower class and welfare. We now need another way to keep the rest of the middle class out of poverty. It has been proven throughout history that giving away free money to a large portion of the population by the other half doesn't work. It creates horrible disincentives and misallocations. One way to return to full employment would be to forcibly de-technologize, like getting rid of traffic lights and putting a person back out into every intersection to direct traffic like they did a hundred years ago. Theoretically this would work but practically it wouldn't because the private sector is competitive and you can't force entire industries to equally reduce their technology. The only other realistic way of spreading the wealth out better is to reduce the work week. And the only way to prevent a shorter work week from further impoverishing the middle class is to institute some form of a wealth tax that targets the elites who have stolen so much of the middle class' wealth. There is no way around this. Many capitalists are repelled by the idea of a wealth tax but it is human nature to resist change that is for the better. We also need to move away from the profit model for allocating capital for much of the economy. Profit is a yearly percentage increase in "wealth". Capitalist theory asserts that overall economic growth and wealth is created by a largely unrestricted private sector efficiently allocating resources such that revenues exceed costs which generates profits that collectively increase wealth for everyone in the economy. Capital is the financial kick-starter that is believed to keep this whole process rolling because it funds the initial business activity which then creates more profits that can be invested as capital somewhere else to create even more profits and wealth, and so the virtuous cycle of capitalism and growth continues. I largely disagree with this model. Furthermore, in an economy that can no longer grow it is not possible for the majority of capital to realize a real profit beyond inflation -- otherwise the economy would be growing. So where is capital to go then? I say into other allocations. In Austrian economics it is widely believed that government spending is a drain on the economy because it is funded by taxing the truly "productive" portion of the economy -- the private middle class -- and therefore should be kept to a minimum. But this is only a result of how today's monetary system is structured. For this to work financially we need a completely new monetary system. The current system is a sham and any analysis of what we can and cannot afford using dollars is meaningless. Do I see any chance of these changes happening? Extremely unlikely since it would require the elites to voluntarily give up control and give back their vast wealth hoards, as well as overhaul the financial system to where they can no longer realize further ill-gotten gains. Zero chance of that happening. It would also require a fundamental shift in understanding by the average person of where wealth comes from, and that profit is not something we should be striving to achieve in today's world of flattening growth. Almost everyone thinks that economic growth is a good thing that we should strive for. Will this attitude change? Not likely, especially when the elites control the message of the media. Furthermore, the majority believes that it is only wacko conspiracy theorists who believe in the existence of a parasitic elite class who is stealing their wealth. Hardly anyone understands how the financial system is rigged to impoverish them. The average person blames other countries for our own problems. They are not willing to accept that these "terrorist" activities are perpetrated by our own governments and elites. Therefore, we should prepare for a worsening economic and social future that will eventually end in catastrophic collapse, all of course to be officially blamed on foreign terrorists. Michael Spence is the real deal.He is against HFT and writes for Project Syndicate.The economics teachers should take a page out of his playbook...Adam how lucky were you at Stanford? That was an awesome video Sterling, Humans Need Not Apply. It sounds like we humans are giving birth to a new species of machines, which are soon to be better and smarter than we were. As Dr Chris so well points out in the Crash Course, all civilizations have grown and thrived when they were able to harness energy beyond their immediate needs. This has progressed from basic tools, to animals, to other humans,to understanding how to use the forces of nature to help, to more advanced tools powered by animals, to tools powered by fossil fuels. Now we face the use of smarter automated tools powered by ???. My answer in looking around is still fossil fuels for the heavy lifting. Sure, a robot/bot computer can run on solar, just like I can. It can survive, not just do the heavy lifting of 20,000 man hours that is in a barrel of oil. The crucial juncture comes when , like the horses of old, the human component of input becomes unneeded. But then, who/what is at the top of the feeding chain? Either humans fight to hold their place at the top of the food (i.e. energy) chain, or they will find that their relevance will continue to decrease. Money is just a way of dividing up the treasure - the threasure being the total "surplus" produced by society. Its just an accounting structure layered on top of the productive economy. Assume in a far future that robotics + 3-d printing results in the vast majority of the humans being entirely displaced from the workforce. They are unnecessary. The productive & service capacity of society maintains itself, and it spits out its surplus and hands it over to the population according to the rules defined (presumably) by some element of society itself. Individuals place their orders with the Big Machine, and stuff pops out either sooner (3d printing at home) or later (something big that must be constructed off-site). Clearly, if anyone can order anything (I'd like a 100,000 ton aircraft carrier, please) they will, so there has to be some sort of limit. Perhaps, as Milo Minderbinder once observed, "everyone has a share." That ends up looking awfully like a "basic income." Clearly if you can contribute "more" to society, that's a good thing and that needs to be rewarded with those people getting a bigger share and/or greater access to the "good stuff" (Chateau Lafite, personal spaceships, etc). That's always the struggle. And how will you keep the masses entertained when they really have nothing urgent to do every day? There were a series of books created by Ian Banks which describes The Culture - a "post-scarcity, utopian, anarchistic society." I found it a fascinating study on how people might behave in such a situation. If trends continue, and we find a fix to our energy and resource issues, that's where we might just end up. Of course, if some individual seizes control over the Big Machine and/or decides that depopulation means he gets lots more of the surplus for himself and his close friends, things might go awry. But for a moment, let's postulate an incorruptible instrumentality and see how that might play out. Or in other words.. a technocratic dictatorship. So Mark_BC, you are a green party supporter? I don't argue with the basic desires, and even some of the basic logic of the greens. But a major question has always been "how do we get there from here"? That question you address with the answer "for now, we don't". I DO think it ignores the basic question of "given unlimited resources, how do you control unlimited procreation until resources are again heavily limited", and the related question "should you do that?" In the past, the answer has been (as with the Jacobians in the French Revolution) for the elites to mass-depopulate mostly others, and inadvertantly sometimes themselves. I have a major problem with that. It's called mass murder, and it is not a proper function of a continuing society. I DO agree with your estimate that our definition of profit and money is horribly skewed, and that a better way of judging profit might help solve some of these problems. But that definition of profit seems to be characterisic of the agricultural-warlike model of society, which is enormously effective at conquering and eating the members of other societies. So unless you can devise a way of conquering an AW society without replacing it with something far worse, you may not be able to get there from here. Maybe robots would do better. Do you give up sometimes? SandPuppy, do you give up sometimes? I am not sure I am doing ONLY the reverse of the trend Adam is mentioning in his article. I decided to build this backhoe mainly for two reasons: 1) because (I thought) the cost of building it is the same or lower than paying someone to do the work I plan to do with, and 2) having some fun building it. Note: The machine cost me about 25% higher than paying someone for the work I plan to do this summer, but this is not a loss as hopefully I expect to have many more summers ahead. This being said, I also did this: remove work from someone and use a machine to do the said work (Straight in line with Adams' article). We can look at the same problem from many angles. It is a communicating vases problem. If we move some work from A to B, then A has less work. And vice-versa. Now, the most important for me: 1) I have a new skill (Far from perfect, but usable): Welding and metalworking. 2) I have a machine to perform some heavy work in the close future (help clear forested area, dig a pond, foundations, etc...). Also, I can offer my services in the area (detrimental to the guy, mentioned above, offering the same services). Other than this new skill, I have developed over the years (30+) a set of skills that allow me to be more versatile. I lived in several parts of the world and in some places you would better be resourceful, otherwise, you are just swallowed by the folks around you. At the base, you must develop a mindset of willingness to learn, experiment, not be afraid to lose money or time, and more importantly develop critical analysis. Also, the willingness to be free as much as you can must be there. Of course, you always need a complement (the help from a neighbor, subcontract something, etc…) but you are not captive of the whole system. The skills I have developed over the years? Here are some (Not all with the same proficiency, but usable and in constant progress). I renovated the garage of our old house in 2001 (Renovated could be seen as the wrong word…). We added one story to the house in 2005 (and rebuild the ugly “new” garage from 2001). In 2009, my wife and I, moved and build a new house. It took 5 years to complete. Having the other half onboard is priceless. We learned a lot, and managed to build something nice with the previous experience. In the light of the current situation, we see this house a bit too luxurious, but it is very hard to sell in this area. So we keep it, stay in it, and will see how the taxes will evolve in the future. With what we know today (I wish I discovered PP back in 2009), we would have built a much smaller house. This one is 3200sqft. This is large for two persons. All these skills will help in case of social and economic change. Or simply between two jobs. Or stay occupied and in shape when retired. Or whatever your motivations and needs. Also, with two fiends we started our own company in 2011. Three complementary profiles: strategic, commercial and technical. A kind of freedom. We have our own destiny in hands. This is a big motivation element. The next steps will be very practical, like building a pond, a 4 season greenhouse, a bigger garden, and also the local community (Last year I posted that we had two nasty guys in the street that compromised all community building efforts– they are gone thanks to a fight between them that burnt one of their houses. No regrets at all and happy ending for the rest of us). Also, I am thinking at getting involved in our municipal life: if I can convince our municipal council to facilitate the establishment of permaculture in our municipality, then this will be a tremendous win. Actually, the population is ageing and decreasing. There is a need to bring in new blood. So, if we have easy rules for permaculture and homesteading, then we may have a chance to reverse this trend. We are far from Montreal and it is understandable why the young leave the place. Capitalizing on what a rural area can give, then it is possible to attract people that wants to live close to the earth. Regarding the backhoe, I never thought that one day I would build one. At first glance, those machines, even the small ones, look very intimidating. We think “No way, I can’t build that", "This a heavy industry task”, etc… but I decided to start this project and if it fails, then losing a few $$$ is not big deal. At the end, it went well (Well, almost, my jacket caught in fire three times because I did not used the leather apron – safety? What’s that?). Overall, much easier than I thought first. So, for the ones that are interested to try, go for it! The risk? A few $$$ if you spend as you go. Usually, most of the failures occur at the beginning. The more you advance, the more chances you have to complete successfully your project. In the end, I just say that the most important factor is willingness. The will to change, to adapt, to do the homework to plan. It is a lot of work, but at the same time very rewarding. This rewarding sentiment makes see things very simple and facilitate undertake new projects. It’s like a drug. What we did, my wife and I, is not magic and we are not exceptional in any way (Except for each other, but there is a big subjective part there). Undertaking projects outside our comfort zone is doable and anyone can do it. We have been taught to stay within the limits the society has set (You! You are baker. You! You are lawyer. Etc…). Well, it is the choice of every person to not cross these virtual (but strong) limits, or to cross some of them, or to cross all of them. Everything can be learned and done. Just make the first step and “So, what?” about the rest. The discovery of PP in 2012, was the spark that set in place the whole picture of what I should do in the coming years. Considering what await us ahead, I just can say a big Thanks to Chris, Becca, Adams and all the ones that regularly posts interesting and enlightening comments. I don't argue with the basic desires, and even some of the basic logic of the greens. But a major question has always been "how do we get there from here"? That question you address with the answer "for now, we don't". I DO think it ignores the basic question of "given unlimited resources, how do you control unlimited procreation until resources are again heavily limited", and the related question "should you do that?" In the past, the answer has been (as with the Jacobians in the French Revolution) for the elites to mass-depopulate mostly others, and inadvertantly sometimes themselves. I have a major problem with that. It's called mass murder, and it is not a proper function of a continuing society. I DO agree with your estimate that our definition of profit and money is horribly skewed, and that a better way of judging profit might help solve some of these problems. But that definition of profit seems to be characterisic of the agricultural-warlike model of society, which is enormously effective at conquering and eating the members of other societies. So unless you can devise a way of conquering an AW society without replacing it with something far worse, you may not be able to get there from here. Yes I'd say I'm green. But they seem naive economically so throw in some moderate libertarianism and I think that fairly characterizes me. As to how we get there from here, I think I've come to accept that we don't. I think procreation slows to less than replacement in modern society which is one reason western countries have so much immigration. But the damage has already been done, there are far too many people in the planet. Maybe if I saw a real effort on the part of out leadership to admit that growth must stop, and to move our economies over to renewable resources ASAP I'd have some hope. Instead I see fossil fuel dependence growing faster than renewables. Every direction we are moving seems to be contrary to where we should be going. The only solution to overpopulation is depopulation. Will we see this in our lifetimes? Maybe, if a world war is started. Maybe future societies will learn from our mistakes and do things differently but I doubt it, it is in human nature to repeat these cycles. Humans are adapted to live in small competing tribes in the African savannah; not to rule the world in global mega societies. The cornucopia view is appealing but centralized hierarchies that dominate our society/economy are not designed to distribute surplus except to insiders/vested interests. If costs matter--which they must if capital is to allocated wisely--then "surplus" is the same as profit. But hey, just listened ended to an add on the radio announcing that the TSA is hiring. And the message is? Cornucopia is the trend IF we assume increasing automation, and a fix to our energy and resource issues. (A fix to energy fixes resources too, especially if the energy = LENR or something like it). Just like the advent of fossil fuels led (more or less) to the current welfare system, if we postulate a step beyond fossil fuels AND increased automation, then increased surplus is the inescapable conclusion. Roman bread and circuses was what was doable back then, these days its an EBT card and section 8 housing and earned income tax credits. In the future - it pretty much has to be larger, given my assumptions above. More surplus = higher living standard + nobody working. Either we get massive depopulation, or the same percentage of a larger surplus gets distributed in some way throughout society, and it will be larger than it is today because of automation. Simple example: asteroid mining via robotics solves the resource problem, assuming we have the energy to get there. And my guess is pop growth will plateau and start to fall too, the same way it has in Germany and Japan. With a nudge from the authorities - either drugs, or laws - it can go even faster. If the plans to "make stuff" are open sourced, everyone has a cheap 3-d printer, and energy is relatively free via LENR, what then? How odd the picture disappeared so I will try again. In case it disappears again it's a picture of fast food kiosks. Right after I saw this I heard a commercial advertising for jobs with the TSA. Isn't it ironic fast food jobs may disappear but people control and harassment is the up and coming booming business. What's next. 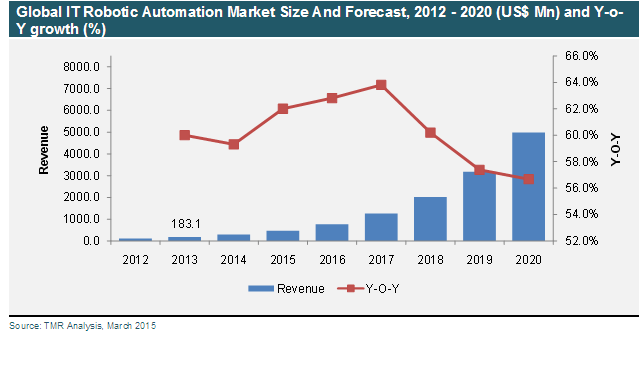 There is a counter cyclical trend rising below automation that many have alluded to. Automation is the last great gasp of a dying culture. Unemployment is running at 23% (all in, including long term unemployed), inflation is running at around 8 - 9%. Resources are starting to collapse, demand for goods is in the process of collapsing. All this has been attendant to an ever increasing amount of automation. Remember the stories of electricity to cheap to meter? Are we still recycling the same old crap. You still see "the farm of the future" kicking around, glass towers of automated equipment with nary a person around. Well the economy never came out of the great "recession" of 2008, we have collectively become the great can kickers, except for those who have made a concerted effort to leave or partially leave the system, but we are running out of road. As someone suggested, who is actually going to be able to afford to purchase automated goods? Automation is the ultimate in ossification, unconscious action, inflexibility. It captures thought in time, in a repetitive action, and then repeats it over and over again. A machine made to cut patterns in a flat metal plate, cannot attach a bumper to a car or assemble a toaster. An idle machine demands production from those that made the huge capital investment. It is exactly what is happening in the oil patch, it's just another form of leverage, it demands acceleration. More resources driven through a dying consumer society - from natural resource to landfill wastelands. The world is alive in ways we are now just beginning to understand. GMO engineering is failing because of its mechanized, repetitive reductionist view of the natural world. The spread of genetic modifications through bioregions, development of antibiotic resistant microorganisms, pesticide resistant weeds, are already tell tale signs of the death of the automated mind set. The farm of the future does not look like gleaming glass automated towers drawn by some who couldn't tell a dandelion from daisy, but is already here in the form of Polyface farms. Its technology, moveable electric fences and chicken trackers. Automated telemarketers? Give me a break, how long before that hits the bust bin of history. Our future lies in the evolution of consciousness, not the machine. Manufacturing requires repetitive, semi-unconscious activity. It is these manufacturing jobs that America has lost. From a consciousness standpoint, it would seem that anything that could be automated, "should" be at some level. Only those things that require consciousness "should" require hiring a human being. Based on where I see AI going - machine vision, machine learning - that's going to be reality in the not so distant future. The AI future I see is not specifically gated by discovery any new hardware breakthroughs. We have all the hardware tools we need right now. It is dependent on applying what we already have to different problem domains. We are starting to develop the pieces necessary to build far more flexible robots than we had previously. As an example, AI can now identify handwritten numbers more effectively than humans. The mistakes they make actually make sense. Once you train a model on a particular problem, it "knows" that problem from here on out, and it can solve it very quickly. At some point perhaps 5-10 years from now, we'll be able to assemble a robot "brain" capable of a wide variety of abilities from a collection of pre-trained models. Upload a new module for recognising something new - the robot can now have a new capability. The secret sauce is in the training of the model. I will go so far as to say that robotics will eventually replace everything that humans can easily do unconsciously - if we solve the energy issue. That's where AI is currently headed - we will end up building a massive amount of unconscious processing power. What we choose to apply it to, that's the only question. This capability is a new thing, and has been enabled by GPUs that provide us with "teraflop" computing. I recall discussions at the beginning of my career how ballistic missile defense was impossible unless we got teraflop computing. Back then, a teraflop was an impossibly large number - the higher end computers the size of washing machines were rated in megaflops, and so BMD was therefore impossible. These days, a high end GPU board (ex: $1000 for the NVidia "Titan") can do 5 teraflops; theoretically you could put 4 in a tower (admittedly with a 1 kilowatt power supply) and that gets you 20 teraflops. This has by itself enabled the whole "deep learning" revolution, which is a field that is so new and un-tapped that a single human can actually understand the current state of the art. Training time is the issue with deep learning, and teraflop computing makes training time run vastly faster, especially for the computer vision problems, and that brings some previously impossible-to-solve problems well within the range of normal people like me. The important takeaway? As an example, it might take that $6000 computer a few hours of computing time to train a model to recognize handwritten digits. But once trained, you can run the model on a low-end phone, and it will take a fraction of a second to translate a picture of handwritten numbers into digits. Or whatever else you need the module to do. Download a new model - you get a new capability. We just need to solve the energy thing. Executing Permaculture design is a skill that can be conducted within a community. Even the smallest of towns and mostly all cities have parkways ( space between the curb and the sidewalk) that could be designed, cultivated, and planted by those who have little or no property of their own. With regards to the growing world of automation & robotization - It may, after the initial outlay is recovered be a more profitable and necessary step into future, however - I have always asked "Where are governments going to find enough revenue when many millions of workers are to become unemployed non-income tax-payers and who will be adding to the numbers of welfare recipients?" Because of the declining Income tax revenue due to redundant workers, governments will have no choice but to impose a tax on companies for every automated machine/robot which has done them out of revenue. Of course governments will need more revenue than what they receive now due to growing numbers of welfare beneficiaries and subsidies for these people. I suspect that down the line, companies who automate will be "eventually" shooting themselves in the foot even though it seems a logical step through rationalization to increase output more effectively and also cut expenditure by a large degree. In the not too distant future I think that companies may be worse off than now. I have recently read an article on the arrival of "Automated Trucks" which should apparently save the transport industry huge money - But what happens with these long-haul trucks if they break down or have tire blow-outs etc in remote areas - Most of these drivers have vast skills to keep checking for all manner of faults pertaining to their trucks & loads and have acquired much knowledge on how to negotiate flooded roads and rugged terrain and repair many faults. In outback areas of Australia for example, these trucks travel thousands of km's each way to service remote towns which are time-dependent on these deliveries - These drivers stop at ranches & cattle stations along the way to have a break when roads are washed out and waiting for signs of a clear road ahead. They have nurtured a friendship over the years with these rural people - Something a machine cannot do! Its not that there is not a place for automation, there are places that it makes sense, it will just never be the dominant paradigm. But this techno fantasy vision of an automated world, with human beings flitting about trying to find things to fill there day is just that, a fantasy. I think that we would quickly find that such a scenario would not be a fantasy at all, but rather a nightmare. Human beings, free from the constraints of the universe, would quickly devolve into monsters. Lottery winners are a perfect example, free from the constraints having to be useful on a daily basis leads to trouble with almost certainty. There are those of course who have awakened within enough of a connection to the universe within, that they can flourish despite the external dysfunction of a large inheritance. The "rational mind" tries to understand the universe by braking it into smaller and smaller pieces, in doing so, cuts the millions of filaments that ties the subject of our observation to the rest of the world. That is the automated mind, it is the mind of dominated by unintended consequences. The starting premise always is that I am outside observer, separate from the universe in which I exist. Transformation occurs when we embrace and accept that we are part and parcel part of the universe in which we find our selves, connected in millions of ways of which we are aware of only a few. The repetitive is antithetical to the adaptive, creative, and the living. Lets usher monocultures, both socially, technologically, and agriculturally to pages of the history books as rapidly as possible. What serves humanity as also what serves the planet, because we are one and the same. Excellent analysis of the emerging crisis. However, the solutions--as the author is no doubt well aware--fall dangerously short for most of the multitudes soon to be displaced by machines. Something more fundamental is required. Capitalism is approaching its conclusion. It cannot function without consumers and most consumers require work in order to earn an income and consume. Without work, they will need a guaranteed income. Unfortunately, as I explain in a forthcoming article in the Journal of Evolution and Technology, guaranteed income schemes as commonly proposed are extremely problematic. I have proposed something fundamentally new, which can be created by a committed group of people relatively quickly, that addresses these issues. I call it a Celebration Society. It's been endorsed by leaders in various fields, and is discussed at www.ACelebrationSociety.com. Other solutions are also possible. We need to start exploring, simulating, debugging and then testing some of these in real life before the unemployment tsunami destabilizes everything in the 2020s. Remember, these jobs are not coming back. Ever. Automation in and of itself is not evil. But sewing the seeds of destruction for our workforce without a plan to put the displaced labor to productive use elsewhere is. As a society, we are sleepwalking into an unemployment nightmare. A former McDonald's CEO warned that robots will take over staff jobs at the fast food empire - because it's cheaper than employing humans. Ed Rensi has said that buying highly skilled robotics is a cheaper alternative than employing people on minimum wage to work in the company's worldwide restaurants. Last month we discussed the fact that officials had approved the latest Five Year Plan for China's economy. The ultimate goal of the plan is to overtake Germany, Japan, and the United States in terms of manufacturing sophistication by 2049, the 100th anniversary of the founding of the People's Republic of China. To make that happen, the government needs Chinese manufacturers to adopt robots by the millions. It also wants Chinese companies to start producing more of these robots, , and to enable that there is an initiative making billions of yuan available for manufacturers to upgrade to technologies including advanced machinery and robots. The manufacturing hub for the electronics industry, Kunshan, in Jiangsu province is proving that that initiative is well underway. As the South China Morning Post reports, thirty five companies, including Apple's key supplier Foxconn, spent a total of 4 billion yuan on artificial intelligence last year, and more companies are going to follow suit. Spurred by the initiative and a desire to cut down on labor costs, Foxconn has reduced its workforce by a whopping 60,000 people thanks to the introduction of robots. Foxconn's headcount went from 110,000 down to 50,000 (adding to the mass layoffs that we have warned will cause further social unrest in China). The underlying warning of my original post above bears repeating: displacing a large percentage of human labor without a plan in place to put that displaced labor to productive use is a sure-fire recipe for long-term crisis. Today, we are badly failing at putting our current excess human capital to productive use. The Employment Policy Institute just released a report finding that the minium wage hikes in Washington D.C. that started in 2014 and continue today, are resulting in layoffs and reduced hours as employers try to find ways to cope with the higher costs. Nearly half of Washington, D.C. employers said they have either laid off employees or reduced the hours of employees to adapt to the District of Columbia’s minimum wage hikes since 2014, according to a report from the Employment Policies Institute. The minimum wage in the District of Columbia has increased from a $8.25 hourly rate in 2014 to the current rate of $11.50 per hour. Mayor Muriel Bowser advocated a $15 minimum wage in her State of the District address earlier this year. “In recent months, the City Council in D.C. has considered enacting a number of new labor mandates, including a higher minimum wage, a bill that would fine employers for schedule changes, and a family leave policy funded by a tax on employers,” the report says. The institute surveyed 100 employers in Washington, D.C. to understand how they would react to a further minimum wage hike. According to the report, just over half of the businesses surveyed said they planned to raise prices in order to offset the cost of a minimum wage hike. Thirty-five percent said they would likely reduce staffing levels and 37 percent said they would reduce employees’ hours or reduce the number of hours they were open for business. Thirty-one percent of businesses said they were very likely to hire more skilled workers in the future to offset the higher wage. One in five businesses said they would move out of the District of Columbia and into Arlington, Virginia where the minimum wage is $7.25 per hour. Sixteen percent of businesses surveyed said they were somewhat likely to close their business if the minimum wage hike were implemented and 6 percent of businesses said they would likely close. “These results are consistent with the best and most recent published research on the minimum wage, which finds that past increases (at lower proposed wage levels) have reduced employment for younger and less-educated employees,” the report states. Labour-force participation among men of prime working age has dropped by more in the US than in any other OECD country apart from Italy in the past quarter century. The decline has been driven in part by weaker employer demand for people with lower skills, according to a report from President Barack Obama’s Council of Economic Advisers. The study on Monday shed light on one of the major concerns about America’s recovery: while unemployment has been falling, a large number of people have also been dropping out of the jobs market altogether. Among so-called prime-aged men between the ages of 25 and 54, the participation rate fell more steeply than in all but one other country in the OECD from 1990 to 2014, the report found. It is now the third-lowest among 34 OECD nations. Part of the reason behind the fall in demand for lower-skilled labour is the drop in manufacturing jobs resulting from technological change. In addition, advances in technology favour some workers with high skills more than others, leading to a hollowing-out of opportunities for people with middle or lower skills. I think there's going to come a time when the HIGH-skilled males drop out of the workforce; and when that happens, the ownership class and the political class, even the banking class is doomed. Only thing is, I'm not raising my son to enter the workforce, because I don't see a future in it. I AM raising him to be skilled though.